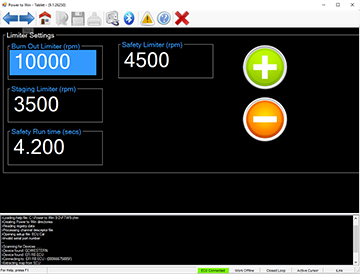 The Tablet App is designed as a portable wireless connection to your ECU that allows basic editing features. The App allows the driver and/or crew chief to monitor engine functions and make instant last minute changes to the system. The Tablet main menu (home screen) is an icon driven interface that allows instant access to all of the applications features. 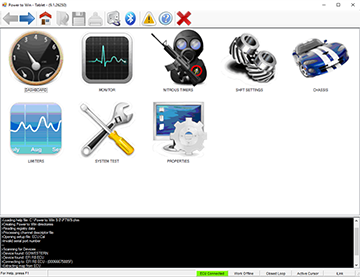 The message center displays program status information, diagnostic error codes, connection information etc. 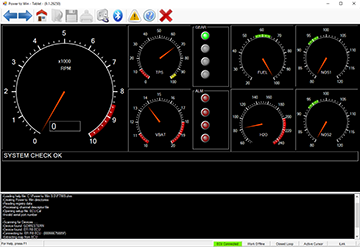 The engine data can be monitored with either the virtual dash gauge display or the numeric channel monitor. 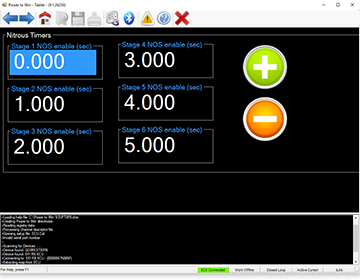 The virtual dash also has displays for gear posision and error codes. Each of the editing windows has a large font touch screen interface to allow easy changes to be made to the engine setup<. Screens are available for Nitrous setup, Shift Controls, Chassis Control functions and more.